I think I have found my next project and it’s perfect for my current knitting mood! I give you Hexi-ghan by verybusymonkey! This afghan beauty is knit one hexagon at a time. After the first one you pick up some of the stitches from your finished hexagon to start the next one. So no seaming!!! This is the perfect project for my mood right now. 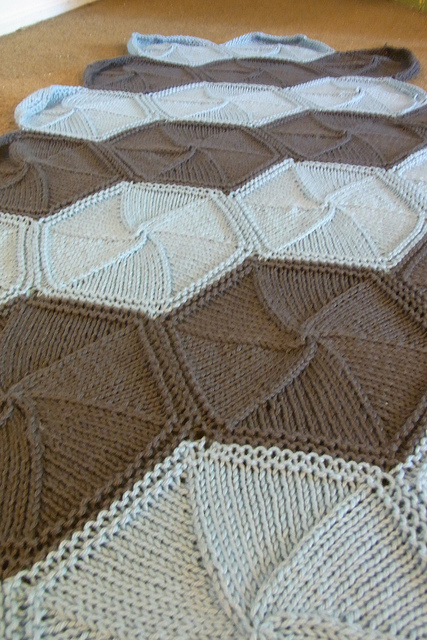 Instant gratification when you complete a hexagon but it builds to a larger project. I haven’t decided if I want to do colors by rows or just knit the colors randomly as I go. Do I want a patterned design or free form art….what would you do? This entry was posted in Knitting, WIPs and tagged afghan, ahghan, bernat, blanket, cotton, cottontots, hexi-ghan, knitting, seamless, stashbustin', WIP by atangledyarn84. Bookmark the permalink. That is beautiful. I think that I’d do rows of each color. Hmm…I would attempt stripes, or maybe start in a corner and have the colors progress outwards. But my inner neat freak can’t recommend random colors!!! That looks like a fun one! This looks like an interesting afghan! Definitely more fun than all those back and forth rows that seem to go on forever!